Catherine (Kate) O’Flaherty was born in St. Louis on Feb. 8, 1850. Growing up in a bicultural home, she spoke both French and English. Her unique level of comfort with new places and value systems allowed her to develop a literary imagination that embraced different lifestyles and world views. Although her rebellious attitude brought disdain from contemporaries, her modern legacy is largely due to her lack of concern for social mores. Chopin’s independent, creative mind was both birthed and refined in the city of St. Louis. She attended the St. Louis Academy of the Sacred Heart from 1855 to 1868. During her time there, she earned high academic honors, was elected into the elite Children of Mary Society and delivered the commencement address. After graduation, she entered St. Louis society as a debutante. Chopin descended from a long line of groundbreaking women. Her great-great-grandmother was the first woman in St. Louis to obtain a legal separation from her husband before going on to raise their five children and run her family’s shipping business. The women in Chopin’s home played a central role in her academic and social education, teaching her French, music and the latest gossip about the women of St. Louis. At 19, she met Oscar Chopin of Louisiana. The two were married a year later, in 1870, and settled together in New Orleans. He admired her intelligence and allowed her much intellectual freedom. These years in New Orleans provided much of the material for her future composition. Tragedy brought Chopin back to St. Louis after her husband’s death in 1882. She returned with their children and bought a house on McPherson Avenue, where she resided until her death. It was here that she began to write. 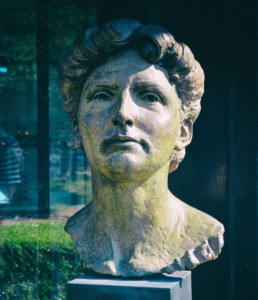 Although her stories and novels were set in New Orleans, her St. Louis upbringing contributed significantly to her literary imagination and penchant for strong female characters. After the death of her mother, Chopin fell into a deep depression. Her doctor suggested writing as an outlet for her grief and she began to compose short stories. With little expectation of literary renown, she was pleasantly surprised by the success and support with which her stories were met. After harsh criticism for the protagonist’s behavior in her most famous novel, “The Awakening,” Chopin stopped writing and her stories quietly faded into relative oblivion. Only the rediscovery of her controversial novel in the 1960s brought her back into the arena of literary greats. Chopin died of a brain hemorrhage after a strenuous day at the St. Louis World’s Fair in 1904 and is buried at Calvary Cemetery in St. Louis. Kate Chopin’s bust sits on the northwest corner of Euclid & McPherson. You can learn more about the Central West End’s Writer’s Corner project here.